Chapters 3 and 4 presented a detailed analysis of the story of John 9 from a speech act perspective. I shall summarise my analysis by combining some important aspects in the following sections. The diagram indicates that all seven divisions, except KJV, agree on two major breaks between verses 12 and 13, as well as between verses 34 and 35. KJV also shows a minor break between verses 12 and 13. Both NRSV and NIV indicate the same structures, and have three major parts. The demarcations by NASB and the New Japanese Bible are identical and display four major parts. KJV only has two major parts, containing five minor parts. TEV and my own divisions share the same number of breaks without considering whether the breaks are minor or major. The only difference between them is in the third break where the breaking point differs. TEV notes the end of the third part at verse 16, while my own divisions consider it at verse 17. The TEV break is rather unique. Hence, while certain breaks are widely accepted, others show the different ways of understanding the flow of the text. Brodie (1993:344) suggests the criterion of physical movement as the clearest structural marker, which is "an indication that a scene is ending or beginning, someone either comes or goes or is called or is thrown out ... (in vv 7, 13, 18, 24, and 35)". His point is plausible, but the demarcation cannot be determined solely on this ground, and not on any other single criteria. It should be combined, taking into account content and other literary features such as other structural markers (e.g., key words), inclusio, the principle of duality, and so forth. It is apparent from the diagram that my own divisions have the highest number of cluster demarcations. This is mainly because of the chiasm found in the text, as mentioned earlier (cf. section 2 in Chapter 4). Therefore, my demarcations can basically be justified once this chiasm is legitimately recognised. Each cluster describes the conversations between the characters. In these dialogues, the chiastic pattern emerges around the thematic, lexical and semantic parallels between the related clusters. I shall discuss this to demonstrate this point. Clusters A and A' refer to the main character of Jesus, and the motifs of coming and sending of Jesus (9:4, 39). The disciples, both of Jesus and of Moses (the Pharisees), are also present in both clusters. These clusters also share the themes of sight, blindness, sin, the works of God (because Jesus' mission was to do the works of God), and the world. Hence, these clusters use, as keywords, the related words of ΊησοΟς (9:3, 39, 41), τυφλός (9:1, 2, 39, 40, 41), αμαρτία (9:2, 3, 41), κόσμος (9:5, 39), and βλΕπω (9:7, 39, 41). Moreover, it is significant to note that all these points serve as evidence for the inclusio formed between the first and last clusters in this Chapter (cf. also section 9.2 in Chapter 4). Clusters B and B' share the same keywords that refer to Jesus, namely Ιησούς (9:11, 35), άνθρωπος (9:11, 35), and εκείνος (9:12, 37). The meaning of the term καθήμενος (9:8), to sit, is linked to that of the word προσεκύνησεν (9:38), to kneel down. There is a contrastive association concerning the blind man's knowledge. In cluster B, the man still did not know Jesus well. When he was asked where Jesus was, he answered "I do not know" (v. 12). In cluster B', however, he came to know Jesus well enough to believe in Him. The theme of knowledge is strongly evident in both clusters; the identity of Jesus is the focal point in this knowledge. The physical presence of Jesus is also a key to these clusters. In cluster B, Jesus disappeared from the scene to reappear in cluster B'. This means that, except for the blind man, Jesus gets the narrative focus in cluster B', but when Jesus is not present in B, the focus shifts to other characters, the neighbours. Since the Jewish authorities interrogated the blind man in clusters C and C', these clusters are linked to each other. In terms of characters, the blind man and the Jewish authorities, the Pharisees in C and the Jews in C', are present in both clusters. The identity and origin of Jesus are the focal points in both interrogations. The most important question was whether or not Jesus was a sinner. The question as to whether or not Jesus came from God was also the main dispute. In order to better understand these disputed points, the Jewish authorities in both clusters asked the blind man the same question concerning the process of the healing miracle (9:15; 9:26). This same question led the man to respond differently in the different situations. While he obediently answered what happened to him in C, he refused to answer and rather challenged them in C'. In addition, both clusters refer to the themes of blindness, sight, sin, and sign. Therefore, these clusters also share related words, namely ανοίγω (9:14, 17, 26, 30, 32), βλέπω (9:15, 25), ποιέω (9:14, 16, 26, 31, 33), Οφθαλμός (9:14, 15, 17, 26, 30, 32), άνθρωπος (9:16, 24) which refers to Jesus, αμαρτωλός (9:16, 24, 25, 31, 34), τιφλος (9:13, 17, 24, 25, 32), and θεος (9:16, 24, 29, 31, 33). The main feature of this chiasm is cluster D. At first glance, this seems hard to believe, because the characters on stage, the parents and the Jews, were not the main characters in the story. Lee (1994:164-165) divides John 9 into three acts (9:1-7, 8-34, 35-41), under which she finds eight scenes in all. She claims: "There is a distinct advantage to this structure as against the more common suggestion of seven scenes in a chiastic pattern" (Lee 1994:164). She argues that to focus on this study's cluster D (which is her Act 2, scene 3) "as the center of the narrative ignores the escalating of hostility which is the main feature of Act 2 and in which the fourth scene [9:24-34] is the most important" (Lee 1994:164). Her argument, however, is not convincing, because the climax of the Jews' hostility is best captured and expressed not in cluster C' (9:24-34), but rather in cluster D, which contains the Jews' astonishing decision in verse 22. In this instance, their determined hostility towards Jesus and his followers is depicted in extreme terms. To focus on cluster D does not necessarily ignore their hostility, but enhances our understanding of their harsh and strongest attitude. In addition, although she further proposes to put a considerable weight to Acts 1 (9:1-7) and 3 (9:35-41) in relation to the above issue (Lee 1994:164-165), to take cluster D as the main feature does not ignore the importance of the points of contrast and similarity between Acts 1 and 3. Furthermore, without cluster D, it may be true that the story would lose a great deal of its suspense, thrill and excitement, because the crucial information that a person's confession of Christ would lead to his expulsion from the synagogue underlies the entire story and plays a significant role in the plot and development of the story. For example, the strength of the main characters' confrontation with the antagonists, the Pharisees and the Jews, originates from the intense relationship with these Jewish authorities. Although this relationship is best portrayed in the dialogue in cluster C', the fiercest relation as its climax is expressed in cluster D, as mentioned earlier. The parents' strange behaviour is conceivable when this information is released. This can even explain the reason why the neighbours brought the blind man to the Pharisees in verse 13 in cluster C, because they might also have been afraid of the Pharisees (for this argument, cf. the section on 'CS' in 9:13). Likewise, when the blind man asked the Jews whether they also wished to become Jesus' disciples, they reviled the blind man (v. 28) and cast him out (v. 34). The reader may be puzzled by their overreaction, wondering why they were so angry with the blind man. However, the reader understands the Jews' reaction, because they were the ones who decided to use such an agreement in order to harm those who wished to associate themselves with Jesus. In addition, this information may highlight the profound significance of the blind man's faith in Jesus in verse 38. Hence, cluster D contains crucial information regarding the entire story, and should thus be regarded as the central structure (cf. also section 6.4 in Chapter 4). In order to explore another side of the relationships between the clusters, I shall examine the way in which Chapter 9 is organised. On the level of the blind man, the protagonist of the story, this Chapter may be organised on the basis of a logical-means-purpose relationship. Basically, Jesus healed the blind man so that he could see both physically and spiritually. On the level of Jesus, the other main character, this Chapter may be schematised in terms of a logical-means-result relationship, because Jesus, by virtue of the healing of the blind man, revealed his identity. He also accomplished his mission as judge, especially with regard to both the blind man and the Jewish authorities. On the level of the Jewish authorities, this Chapter may be organised on the basis of a logical-reason-result relationship. Because they rejected Jesus, the man from God, they became blind and were thus declared guilty. Finally, despite all these unique relationships between the clusters, including the chiasm, it is a relief and amazing to know that the story as a whole develops according to a typical temporal progression. Hence, the entire narrative is organised cohesively. After all, I hope that all the above arguments will help justify my own cluster demarcations of Chapter 9 of John's Gospel. Based on the speech acts used in this story (cf, 'Diagram of speech acts used in John 9' in Appendix 5), I shall discuss some significant points. To begin with, on the character level, when the five utterances of the neighbours in cluster B are examined, three of these are question speech acts. It can, therefore, be said that question speech acts are dominant. Likewise, when the Jewish authorities' (the Jews and the Pharisees) utterances in clusters C, D, C' and A' are scrutinised, six out of ten also constitute question speech acts. On the other hand, five out of seven utterances of the blind man in clusters B, C and B' (excluding C') are responsive speech acts. Similarly, two out of three utterances of the parents in cluster D indicate responsive speech acts. These figures demonstrate the roles assigned by the author to specific characters in the story. The neighbours, along with the authorities, play the role of interrogators, and the blind man and his parents respond to these interrogators. This question-answer form basically makes up the story. The way in which the author organises this narrative can also be perceived by glancing at the speech acts used in the story. Secondly, a few clusters display some peculiarity. Among the dialogues conducted between the characters, those in cluster C' are distinctive. In this cluster, a wide variety of speech acts are used to depict the heated debate between the blind man and the Jewish authorities: assertive, descriptive, informative, confirmative, dissentive, disputative, responsive (so far, all Constatives), requestive, question and requirement (these three are Directives). In addition, all the utterances have more than two illocutionary forces, including the cases of indirect speech acts. These facts indicate that the language of the characters appears to become very complex in order to increase its rhetorical power, especially in the case of attempting to persuade the opponent(s). To put it differently, this is attested by the utterances used by the Jewish authorities. As mentioned earlier, more than half of their utterances are question speech acts. In cluster C', however, this proportion of question speech acts decreases to less than half, and the majority of their utterances include more than two illocutionary forces. In addition, this same point is even more strongly certified by the blind man's utterances. As noted earlier, the majority of his utterances, except in cluster C', are responsive speech acts. In cluster C', particularly in verses 30-33, his utterances use various kinds of speech acts and have more than two illocutionary acts. In 9:31, his utterance even has four illocutionary forces. The tendency exhibited in cluster C' is quite striking. On the text level, it is a definite trait that all the narrator's utterances are informative speech acts. The narrator intends to tell a certain story to the reader. As mentioned earlier (section 3.1 in Chapter 2), Chatman's (1978:165) remark that the characters reserve a wider range of illocutions than the narrator, is well attested in this story. In addition, it is noteworthy that only 9:23 has an additional speech act that is confirmative in the particular speech situation (cf. the section on 'IA' in 9:23). Besides the narrator's utterances, the characters' two utterances also have illocutionary forces on the text level. The Pharisees' utterance in 9:16a has an additional illocutionary act of assertive, resulting from the irony designed by the author on the text level. The parents' utterance in 9:21ab also has an additional illocutionary act of concessive, because only the reader (and, of course, the author) can perceive this particular illocutionary force on the text level. In this section, I shall first examine the use of macrospeech acts (cf. 'Diagram of speech acts used in John 9' in Appendix 5), and I shall discuss a macrospeech act for the entire chapter later. On the story level, macrospeech acts have been identified as follows: cluster A - assertive, C - descriptive, B' - advisory, and A' - confirmative. No macrospeech acts can be identified in clusters B, D and C' and, in the case of clusters D and C', result from the failed communications between the characters. In the case of cluster B, there is no responsible speaker who controls the dialogue. In an assertive macrospeech act in cluster A, Jesus makes an important statement about the works of God by the light of the world. In a descriptive macrospeech act in cluster C, the characters are attempting to identify the man who healed the blind man. It is important to note that their dialogue has failed, but this is not failed communication, either. It is simply inadequate or insufficient in reaching the communicative goal. In an advisory macrospeech act in cluster B', Jesus challenges the blind man to become a believer for his own sake. In a confirmative macrospeech act in cluster A', Jesus confirms the Pharisees' blindness and sin. Therefore, diverse macrospeech acts are employed to depict the different and unique dialogue scenes in the story. The various uses of macrospeech acts make this narrative very interesting. a. In an informative macrospeech act in cluster A, the author informs the reader that Jesus, the light of the world, can manifest the works of God. b. In a confirmative macrospeech act in cluster B, the author intends to validate the reality of Jesus' miracle. c. In an informative macrospeech act in cluster C, the author reveals that the identity of the miracle worker is an adequate issue to cause a schism among the Pharisees. d. In an informative macrospeech act in cluster D, the author discloses the important information about the Jews' decision that anyone who confesses Jesus as Christ will be cast out of the synagogue. e. In a confirmative macrospeech act in cluster C', the author confirms that Jesus is not a sinner, but the one who came from God. f. In an advisory macrospeech act in cluster B', the author challenges the reader to continue to believe in Jesus. g. Cluster A' has two macrospeech acts: informative and divine verdictive. In an informative macrospeech act, the author tells that Jesus came into this world for judgment. In a divine verdictive macrospeech act, Jesus intends to pass his judgment on the Pharisees. However, on the story level, the Pharisses do not recognise this aspect. One should note that Jesus is always the focus or the main topic in these macrospeech acts. In comparison with the fact that all the narrator's utterances are informative microspeech acts on the text level, it can be noted that not all of the author's macrospeech acts are on the same level of informativeness. This indicates that the author's use of speech acts is different from that of the narrator. The author uses the narrator strictly as a storyteller. In addition, the author consciously uses the narrator's monotone speech acts and a variety of speech acts employed by the characters in order to achieve a specific aim in the narrative. What is this aim? In other words, what can be defined as a macrospeech act for the entire story of John 9? In this instance, I shall employ the macrorules to determine this. By virtue of the Construction Rule, the informative and confirmative macrospeech acts in clusters A and B entail the proposition (i) that Jesus, the light of the world, manifests the works of God in his miracle. By the same Construction Rule, the informative and confirmative macrospeech acts in clusters C, D and C' entail a new proposition (ii) that the identity of Jesus is that of the Christ who came from God. Similarly, by virtue of the Construction Rule, the divine verdictive and informative macrospeech acts in cluster A' make a further proposition (iii) that Jesus' mission to the world is judgment. All these new propositions move up to the next higher level. The advisory macrospeech act in cluster B' also goes up to a higher level by virtue of the Zero Rule (iv), because of its importance and distinctiveness among the rest of macrospeech acts. 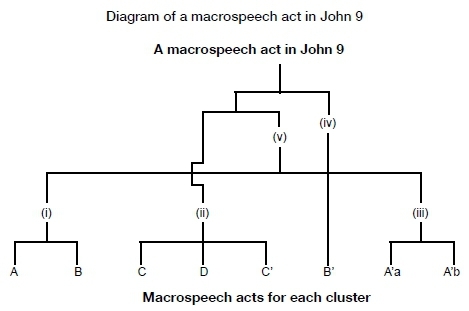 The following diagram displays the process of achieving this macrospeech act in John 9. The aim of this section is to briefly survey the important communicative strategy employed in John 9. As I have scrutinised such strategies in great detail in the text analysis, I shall implement this from a different angle: to observe how particular strategies have helped analyse the communication that has taken place on both the story and the text levels. I shall investigate the use of Interpersonal and Textual Rhetorics, other strategies, symbolism, irony and motifs (or themes) separately. a. The observation of the rules of Interpersonal and Textual Rhetorics indicates that the language is used as it is supposed to be used, in the sense that the speakers are trying to contribute to the goal of a conversation by means of their utterances. b. Breaking these rules indicate that the language is not used as it is supposed to be used. This means that the speakers are either unwilling to contribute to the goal of a conversation, or trying to communicate more than what is said. Breaking rules becomes very important, especially in the latter case, where the notion of implicature is used to explore the meaning of the violations. It may not be necessary to provide examples of the adherence to these rules, as the majority of the utterances do adhere. The Jews' utterance in verse 34 portrays the typical example of speakers violating the conversational Principles and Maxims with a view to opting out of the dialogue. The Jews' utterance violates the Maxims of Quantity, Quality, Relation, Manner, Approbation, Agreement and Transparency, and the Principles of Pollyanna, Processibility and Clarity. It nearly breaks every conversational rule. On the other hand, as far as the above rule-breaking case is concerned, an indirect speech act is a good example of the subcase where the speakers are trying to communicate more than what is said. An indirect speech act usually occurs with the transgressions of the Maxims of Transparency and Ambiguity under the Clarity Principle, and of Manner under the Processibility Principle (e.g., vv. 27b, 41). The neighbours' indirect speech act, for example, is used to avoid their embarrassment (v. 8a). In verse 40, the Pharisees' indirect speech act serves to brilliantly portray their mixed and confused thoughts about their own spiritual state. All of the above examples indicate a way in which a speech act analysis is conducted in order to examine the communication process in the text. I shall now examine the contribution of each conversational rule to the text analysis of John 9.
a. The Quantity Maxim helps the reader comprehend the specific speech situation and examine how the narrator cultivates the reader's imagination (vv. 1, 8a). This Maxim also uncovers the speakers' attitudes in terms of economy in their utterances (e.g., vv. 5, 6, 9, 10, 13, 14, 15ab, 23). b. The Quality Maxim helps establish the narrator's role as the reliable guide for the reader (vv. 1, 7b). This Maxim also reveals the speakers' attitudes in terms of sincerity when they speak (e.g., vv. 8b, 9b, 15b, 18, 19, 21ab). By virtue of the argument of the Quality Maxim, a speech act analysis proves its usefulness even in the interpretation of the text, which necessitates the consideration from an historical context (v 22). narrator's utterances in the specific speech situations (e.g., vv. 2, 3, 6, 11, 13, 14, 22, 27b). The author uses this Maxim to interact effectively with the reader, especially to disclose the blind man's (past) hardship (v. 8b). This Maxim construes the motive of the Pharisees' question in verse 17a. This Maxim also helps highlight the significance of cluster D in relation to the remaining clusters (cf. section 6.4 in Chapter 4). d. The Manner Maxim discloses the nature of the speakers' utterances (e.g., vv. 4, 7, 14, 16a, 21ab, 23). This Maxim plays a significant role in the author's changing to the term Jews (v. 18). This Maxim also helps examine how the characters and the reader understand the expression of the Son of Man (v. 35). e. The Politeness Principle plays an important role in the parents' organisation of their speech act in verse 21cd. f. The Tact and Generosity Maxims uncover the parents' attitude in their answer to the Jews (v. 21cd). g. The Approbation Maxim helps understand the function of irony (v. 41; cf. v. 28, 34). h. The Modesty Maxim may enrich the meaning of Jesus' utterance in verse 37.
i. The Agreement Maxim helps analyse the neighbours' motive to make their utterance in verse 9b, which is their politeness towards their dialogue partners. The violation of this Maxim helps highlight the speakers' intention to persuade the hearers to change their views regarding the miracle worker (v. 16b). j. The Sympathy Maxim helps explain the disciples' attitude in their question (v. 2), and uncovers the author's sensitivity towards the needs of the reader (v. 22). k. The Phatic Maxim explains the parents' attitude in their reply to the Jews (vv. 21ab, 21cd). l. The Politeness and Irony Principles describe the significant usage of verbal irony in the blind man's utterances (vv. 27b, 30, 31). By contrast, the lack of the use of irony by the Jews can be explained by their constant breach of the Politeness Principle, for they overtly and verbally abused the blind man when they attacked him (cluster C'). m. The Banter Principle explains Jesus' motive and attitude expressed in his utterances to the blind man (vv. 7a, 35). The Banter and Economy Principles also help analyse the intensity of the drama (v. 7a). n. The Interest Principle reveals how the author entertains the reader through the Pharisees' utterance in verse 16b and through Jesus' utterance in verse 37. This Principle uncovers how the author surprises the reader through the narrator's utterance in verse 16c (cf. also vv. 21cd, 35). This Principle also explains how the author creates more reader interest in the story (v. 19). o. The Pollyanna Principle, in conjunction with the Agreement Maxim, helps analyse the neighbours' motive for making their utterance in verse 9b; this indicates their politeness towards their dialogue partners. This Principle also helps clarify the use of irony (v. 41). p. The Morality Principle explains the blind man's omission of some details of the miracle event in verse 15b. This Principle also explains the terse narration (v. 14) and the parents' attitude in their reply to the Jews (v. 21ab). a. The Processibility and Clarity Principles reveal the perspicuous nature of the characters' utterance (e.g., vv. 21ab, 27b). b. The End-Focus and End-Weight Maxims stress the significance of the language formation (e.g., vv. 3, 6, 7b, 21ab, 35). c. The End-Scope Maxim highlights the significance of the language formation (e.g., vv. 3, 18). d. The Transparency Maxim reveals the nature of the language used in the characters' utterances (e.g., vv. 16a, 21cd). e. The Ambiguity Maxim helps prove the perspicuous nature of the narrator's utterance in verse 23. This Maxim also reveals the ambiguous expression in the language (e.g., vv. 9b, 27b). f. The Economy Principle sheds some light on the narrator's intrusion in verse 7a (cf. also v. 23). This Principle also helps the reader understand the terse language used by the characters (e.g., vv. 20, 27b, 35). g. The Reduction Maxim explains the motive for the use of pronouns (e.g., vv. 1, 8a, 13, 15c, 21ab, 21cd, 37). i. The Iconicity Maxim may explain the imitative aspect of the message in Jesus' utterances (vv. 39, 41). a. The author uses mutual contextual beliefs to enhance communication with the reader. For instance, in order to understand the significance of Jesus' actions, mutual contextual beliefs such as the knowledge of the Old Testament, the usage of saliva in ancient society, the challenge and response, the Sabbath laws, baptism, and so forth play an important role (v. 6). The mutual conceptual belief concerning Jesus' 'I am' sayings helps the reader understand the significant implication of the blind man's answer in verse 9c. The mutual religious beliefs in the use of the terms prophet (v. 17b) and the Son of Man (v. 35) help the reader understand the meanings in the characters' utterances. b. The author's strategy of secrecy and information control is used in the narrator's utterance concerning the Jews' decision, in verse 22, to maximise its impact on the reader. The introduction of the Sabbath issue in verse 14 is a brilliant strategy of information control, and communicates a few significant points to the reader. c. The important factors that also enhance the communication between the author and the reader are not irony, but the observation of the Interest Principle and the technique of reader victimisation (v. 21cd). d. The notion of display texts describes the assertibility and tellability of the story of John 9. These are especially shown in the narrator's utterance in verse 22.
e. For more effective communication with the reader, the question-answer form, the scheme of topic of the conversation (vv. 3-5, cf. the analysis of v. 5), the techniques of puns (v. 35), adjacency pairs (v. 36), and so forth are used. f. The progression of the blind man's perception of Jesus (the comic movement) and the progressive depreciation of Jesus by the Jewish authorities are used to highlight their peculiar responses to Jesus. From a speech act perspective, these techniques can be analysed by means of the notion of mutual story belief (cf. the analysis of v. 17b) and the operation of the Relation Maxim (cf. the analysis of vv. 38a and 41). g. A rhetorical question is used to express an emphatic declaration of the Jewish authorities in verse 16b (cf. also v 34b). h. In addition, the use of inclusio, chiasm, contrast, parallelism, repetition, and so forth throughout John 9, helps the author create a masterpiece of literature. Although there is an overlap with some of the items mentioned above, it is worthwhile to compare the above observations and the author's strategies elucidated by means of other methods, for instance, narratology and reader-response criticism. From a narratological perspective, Resseguie (1982:303) summarises: "Because the form and content are so carefully woven together, John 9 is a superb piece of literature. Dualistic images, contrasting opinions, opposing movement of plot, and diverse characterizations all work together to show the reader the interrelationship between light and judgment". Stibbe (1993a:106) highlights the author's technique of "showing" and "telling" in cluster D (cf. section 6.4 in Chapter 4). According to Du Rand (1991:103), "Chapter 9 ... starts with a blind man and ends with the 'blind' Pharisees. The whole chapter acts as a hinge from chapters 5-8 to chapter 10". In addition, Martyn ( 1979:26) points out the author's use of the law of stage duality throughout the story of John 9 (cf. the analysis of 9:8). From a perspective of reader-response criticism, Staley (1991:68) contends: "As in the case of the bedridden man of John 5, careful attention to repetition, the interplay of narration and direct speech, and the dynamics of reading in John 9 have revealed hidden nuances in the Johannine art of characterization". From a theological point of view, the theological concept that God is speaking to man through Jesus, "is etched sharply against the background of John's perceptive presentation of humanity in all its color and concreteness. At this he is a master, and it is nowhere more apparent than in the story of the man blind from birth" (Smith 1986:51). This section aims to summarise Johannine symbolism used in John 9 as one of the author's communicative strategies. Symbolic expressions usually invite violations of the Manner, Ambiguity, and Transparency Maxims and the Processibility and Clarity Principles (cf. the section on 'CS' in 9:4, 5, 39, 41). Yet, the fact that the author deploys the symbols despite this indicates that the symbolic expressions can convey his message more effectively or significantly than the conventional expressions. In fact, as analysed in the text analysis, a great dramatic effect is cultivated for the reader by the use of metaphorical language such as the supporting symbols of day and night, not to mention, the core symbol of light (vv. 4, 5). The way in which the symbolic expressions of sight and blindness are formulated in Jesus' utterance is motivated more by the expressive and aesthetic aspects of communication than by efficiency (v. 39). We can, therefore, conclude that the author employs symbols to enhance communication with the reader. As indicated in section 5 in Chapter 3, the purpose and function of the symbols used in John 9 have been examined according to Painter (1986:52) and Koester's (1995:12-15) claims in the text analysis. I shall now review important instances of the symbolic expressions from this angle. With reference to Painter's explanation of the three purposes of Johannine symbols, the day and night imagery used in 9:4 does not directly reflect Painter's purposes. Since these symbols are primarily used to describe the importance and urgency of God's works, it appears that the important factor, namely that the symbols serve to evoke faith or provoke unbelief, plays no role. Only the third purpose, namely that the symbols elicit a new understanding of God through Jesus, can be connected with these symbols in terms of God's works. On the other hand, Koester's thesis that the theme of Christology lies at the primary level of meaning in Johannine symbolism and that of discipleship at the secondary level, perfectly portrays the symbols of day and night, for these refer to the works of Jesus and the disciples. Unlike the day and night imagery, Painter's three purposes are well attested by the symbol of light in 9:5. This symbol depicts "the judging character of the revelation" and provides "a new understanding about God" (Painter 1986:52). This imagery of light also deals in detail with the issue of unbelief. As for Koester's thesis, the light symbol in this verse is a good example to demonstrate his thesis. Painter's claim is further confirmed in the water imagery in 9:7. As this symbol points to spiritual cleansing of sin, the symbolism certainly deals with the problem of unbelief as the ultimate sin in Johannine terms, confronting those who did not believe, and leads to a new understanding of God through Jesus as the true Siloam. With regard to Koester's thesis, the symbol of water is impressively connected to the theme of both Christology and discipleship. The pool of Siloam symbolises the one who was sent by the Father. Washing in the water of Siloam signifies spiritual cleansing, which anticipates spiritual sight and growth in Jesus' disciples. With reference to Painter's three purposes, the symbols of sight and blindness in 9:39 and 9:41 are closely connected with the concepts of belief and unbelief, the judging character of the revelation, and a new understanding of God. The use of these symbols, therefore, attests to Painter's claim. As for Koester's thesis, these symbols are related primarily to the theme of Christology and secondarily to that of discipleship, for these symbols are used to describe Jesus' mission in verse 39, and Jesus' judgment and the Pharisees' spiritual state in verse 41. 'Sight' is linked to a starting point of discipleship. From the above observations, Koester's thesis of the twofold structure of Johannine symbolism must be agreed to: Christology and discipleship. This is clearly disclosed in 9:4-5, portraying Jesus as the light of the world, and referring to the work of God as the works that both Christ and his disciples should carry out.5 The symbols of day and night are also closely associated with Jesus and God's work; hence, with the idea of discipleship. The symbol of Siloam in 9:7 also points to Jesus, the sent one, and to the obedience of a disciple, the man born blind. In addition, it was revealed how the images of sight and blindness in 9:39-41 enhance our understanding of salvation and judgment, and how these images convey the implicit messages about Jesus and discipleship. Those who can perceive and follow Jesus as the Messiah are the ones who have sight. Those who cannot 'see' this truth are the blind, and are thus condemned. These significant points remain powerfully in the reader's mind by virtue of the use of these symbols. As it proceeds, this analysis elucidates and clarifies Painter's three purposes of the symbols in John 9. Indeed, the symbols addressed the problem of unbelief, and displayed their judging character of revelation. They brought a new dimension of understanding God through Jesus. In this respect, another remark by Painter (1986:53) should be added: "The purpose of the symbols is not only to reveal God through Jesus, but also to restore the image of God to man". The Jewish authorities distorted the perception of God, as demonstrated in their understanding of the Sabbath law as well as in dealing with Jesus. The symbols in the narrative, particularly that of light, have signified the way in which the characters and the reader are meant to comprehend God in the Father and in the Son. Therefore, these symbols affirm their claims rigorously, with a rare exception (v. 4). Another important aspect is that the symbols do not only reveal, but also conceal the transcendent concepts from those who cannot see beyond the symbols. "The effectiveness of the symbols is dependent on perception ... The symbols are used to enable the blind to see, but the meaning of the symbols can only be known by those who see that they point beyond themselves to the revealer and through him to God" (Painter 1986:54). In addition, Koester (1995:27) points out: "It has often been noted that the root meaning of the word symbol is 'to put together', and in John's Gospel the symbols help to disclose how apparently contradictory ideas can be brought together" [Koester's italics]. For example, the symbol of the light of the world is used to reconcile (or elucidate) the contradictory idea of acceptance and rejection evoked by the one who was sent by God (Koester 1995:28). Hence, Johannine symbolism in John 9 is used effectively to communicate the author's viewpoints to the reader. Firstly, according to my analysis (cf. 'Chart of irony in John 9' in Appendix 6), there are many instances of irony in John 9. In fact, this Chapter features twenty-nine occurrences of irony altogether. This is sufficient proof that John 9 is rich in irony (Dodd  1985:357). Secondly, there are many situational ironies: twenty-four out of twenty-nine ironies. All these situational ironies can only be perceived on the text level, and the reader's knowledge is a key to understanding these ironies. Of all the situational ironies, dramatic irony is the most used form of irony in this Chapter, and occurs eight times. This irony can be perceived by the observer's knowledge of what the victim has yet to find out. Out of eight instances, the Jewish authorities fall victim to irony five times, based on their ignorance about the miracle details (v. 15b), religious truth (v. 16b), Jesus' identity (vv. 16a, 24) and their own spiritual state (v. 40). They are the major targets of Johannine irony. The neighbours turn out to be the victims once, concerning the identity of the healed man (v. 9b). The blind man also becomes the victim once regarding the identity of the Son of Man (v. 36). The most striking victim would be the reader (v. 21cd), for the reader is not meant to be the victim of irony in John's Gospel (Culpepper 1983:179). In verse 21cd, unlike the author, narrator and characters, the reader does not know the specific reason for the parents' answer. The most remarkable phenomenon is that the Jewish authorities are the victims in four instances of irony of event and in seven instances of irony of self-betrayal. In ironies of event, the characters' utterances reveal what the Jewish authorities do not expect, nor desire. There was a schism among the Jewish authorities in verse 16c. They wanted to deny the miracle, but the parents' reply to their question established the reality of the miracle (v. 20). In verse 31, the blind man was teaching a religious truth to these religious authorities. In verse 34a, the authorities unconsciously reconfirmed the reality of the miracle healing in dismissing the blind man. In ironies of self-betrayal, the Jewish authorities' own utterances unconsciously reveal their own ignorance, weakness, errors or follies. They uncovered their ignorance of Jesus' identity (vv. 16a, 29), God's business (v. 24) and their own spiritual state (v. 40). They also revealed their errors in referring to Moses (v. 28) and to the blind man's sinfulness (v. 34a). They even exhibited their weakness that they could not determine an issue by themselves (v. 17a). These ironies silently penetrate the reader's mind, conveying the author's negative perspective on the Jewish authorities. The irony is indeed a powerful tool in the communication process. The author's slightly different usage of irony, on the other hand, is evident in five instances of irony of dilemma. The Jewish authorities are made the target only twice in this irony, when they disagreed with the identification of the miracle worker (v. 16c) and when they were left with the responsibility of their own judgment (v. 21ab). The parents also experienced a dilemma and became the victims in this irony (vv. 21ab, 21cd). The blind man also had to choose between his own belief and politeness towards the Jewish authorities (v. 25). In terms of the number of occurrences, verbal irony is not as significant as situational irony, of which there are only five instances in John 9. However, in terms of both function and effect of irony, verbal irony may be more significant than situational irony. From a speech act perspective, the striking feature of verbal irony would be that this type of ironic utterance has more than two illocutionary forces. Although Amante (1981:80) holds that "[i]ronic speech acts clearly are indirect speech acts", this study reveals that this is not entirely true (cf. also section 1.6 in Chapter 2). In fact, three out of five verbal ironies identified in John 9 are not indirect speech acts (vv. 16a, 30, 31). More than two illocutionary forces can be detected in these three ironies, and verbal irony in verse 31 even has four illocutionary forces. The author (v. 16a), the blind man (vv. 27b, 30, 31) and Jesus (v. 41) use instances of verbal irony. As Duke (1982:188) and Culpepper (1983:175) indicate, the blind man is the typical and major in John 9. The ironies of the blind man's wit and personality also develop as the story proceeds. The reader finds increasing strength and confidence in the man. On the contrary, the role of the Jewish authorities, as the άλαζων, also gradually increases (Duke 1982:232; Culpepper 1983:175). It is remarkable that, in every instance, these verbal ironies target the Jewish authorities. These ironies mock and condemn the authorities and their perception about Jesus and their spiritual blindness. The author effectively uses these ironies to draw the reader's attention to the language used by the characters to strengthen the bond between the author and the reader. Another significant point in the use of irony in John 9 is that, in some instances, the characters' utterances involve more than two kinds of irony. Verbal and situational ironies occur simultaneously in verses 16a and 31, whereas more than two situational ironies occur in verses 16a, 21ab, 21cd, 24, 34a and 40. Furthermore, as examined in my analysis, two verses comprise ironic expressions, but are not ironies themselves. Jesus uses the term Son of Man in verse 35, and Duke (1982:191) considers that this term "serves a crucial ironic function". However, it should be regarded as a device of puns on the term man. Although Bultmann (1971:340) finds irony in verse 39, my analysis indicates that Jesus' utterance in verse 39 merely contains an ironic and paradoxical expression and is thus not an instance of irony. I examine the issue relating to the stability of Johannine irony in John 9, for this is an important issue in its interpretation (Culpepper 1996:194; Thatcher 1999:54ff.). My analysis indicates that all verbal ironies in John 9 are stable. These are intended, covert, fixed and finite. However, all situational ironies are construed as unstable ironies in the sense that there is basically no ironist and thus these are not intended. Viewed from a different angle, the author being the ultimate designer of these ironic situations, the result may not be the same (cf. Moore 1994:43-64; Thatcher 1999:54). Extended irony in John 9, which the author designs throughout this cluster, concerns Jesus as judge.6 Since the incident of the miracle, Jesus and the blind man were always on trial. In this trial, the Jewish authorities mainly played the role of judge. However, Jesus became the ultimate judge when he stated the purpose of his mission in verse 39. This fact represents strong irony that reflects negatively on the former judges, because the one whom they were judging was now the judge before them. Jesus as the judge passed his judgment on them (v. 41). Ironically, throughout this Chapter, as in John 8, these authorities were the opposite of what they thought (Ball 1996:85). Culpepper (1983:169-175) discusses and lists six major objects of John's irony. The first three objects, namely the rejection, origin and identity of Jesus,7 are well attested as far as John 9 is concerned. In fact, the fundamental irony of the Gospel, namely that the Jewish authorities rejected the Messiah they eagerly expected because they could not 'see' Jesus' real origin and identity, is also central to the irony of this Chapter (Culpepper 1983:169). As Duke (1982:191; cf. also Karris 1990:48) points out, the ironic aspect of John 9 is summarised in verse 39: "For judgment I came into this world, in order that those who do not see may see, and that those who see may become blind." I shall examine how the motif of suffering is used as one of the author's communicative strategies to make this story more significant. In my analysis (in section 1.3), a macroproposition for the entire John 9 is identified as follows: Jesus, the light of the world who came from God, manifests the works of God. This indicates, as Dockery (1988:14) points out, that the motifs of revelation and judgment that form the basis of the entire Gospel, are also essential to the story of John 9 (cf. Morris 1971:475). Therefore, admittedly, the motif of suffering is not the most important motif in this story. However, just as without bones a person cannot hold his entire body, he cannot move his body properly without muscles. Similarly, once the 'bones' (the motifs of revelation and judgment) of the narrative are identified, it is important to examine the 'muscles' that effectively 'move' the narrative. In this instance, the motif of suffering is used as 'muscles' to move the events of the narrative towards the author's desired end. This motif, which underlies the entire narrative (for this observation, cf. below), not only helps the reader comprehend more important motifs of revelation and judgment, but also brings excitement and thrill to the story. I shall briefly recapitulate these points, especially the latter one. In 9:1, in the first cluster A, the theme of suffering is introduced from the outset in the narration that a man was born blind. In verse 2, the issue of suffering is described in the disciples' question concerning the link between sin and his blindness. Their question reflects the common Jewish understanding of suffering, and their negative perception should be corrected in the sense that this is not always necessarily the case. Otherwise, people would be trapped and forever suffer from this negative understanding. In verse 3, Jesus provides an alternative answer to this suffering issue. The blind man's suffering was not caused by sin, but was for the sake of God's work. To prove this, Jesus performed a healing sign on the man. Jesus' answer and miracle perfectly correspond to the third purpose, namely God's glory, of Boice's (1977:25) proposal (section 6 in Chapter 3). Cluster B reports the harsh reality when the blind man had to sit and beg alongside the road (v. 8). This hardship is another instance of the motif of suffering in the story, and this suffering helps form the blind man's character. In the divided opinions among the neighbours (v. 9), the motif of suffering is in two forms. One is that the divided opinions may have caused unpleasant feelings in all the neighbours who participated in the controversy. The other is that some neighbours remained in a state of unbelief towards God's work, even after witnessing the healing of the blind man. This means that they would also remain in sin and darkness. In cluster C, the blind man underwent the first interrogation by the Jews. The fact that the man was brought to the Jews in verse 13 reveals that his appearance before the authorities was not his idea. He was, to a certain extent, forced to appear before them in the trial setting. This indicates another instance of the motif of suffering. As the trial proceeded, their interrogation became serious and their attitude was considered to be hostile - first towards Jesus and, secondly, towards the blind man who was a witness for Jesus. In this instance, one should note the authorities' opposition; any opposition is linked to suffering on the part of the oppressed or criticised. This suffering is constructive in terms of the man's growth of faith (v. 15b). In verse 16, Jesus' work of revelation and judgment created an uncomfortable and critical situation among the Pharisees, for the schism set in. This indicates that they were also suffering in their own way. Since this suffering was a consequence of their own unbelief, this suffering could result in a corrective purpose. Cluster D portrays the Jews' interrogation of the parents. The motif of suffering may be depicted most explicitly in this cluster. Three different ironies of dilemma in verse 21, in which the parents and the Jews are the victims of irony, indicate the occurrence of the motif of suffering. Their suffering may have a corrective purpose for them. The Jews' decision in verse 22 gives rise to the motif of suffering in two ways. For Jesus' followers, the decision was viewed as a fierce persecution against them. This suffering was meant to be constructive in that they were encouraged to attain a more adequate faith. From the Jews' perspective, they were also suffering, because they were required to make such an agreement against their once fellow synagogue members because of Jesus. From the Gospel's point of view, the Jews' suffering is corrective in that they might come back to the 'right faith' in the God of Israel. In cluster C', the heated trial scene also provides some instances of the motif of suffering. This motif can be found in the actions and utterances of both the blind man and the Jews. Because of the intense debate, their attitudes and language also became fierce and aggressive. From the blind man's perspective, first, the fact that the man had to reappear in court is in itself indicative of the man's suffering. As pointed out earlier (in the section on 'CS' in 9:13), nobody enjoys being judged or having to testify in a trial in which the life of the person who helped him is at stake. This interrogation was not his first time. The man was then asked to testify to what he did not want to tell (v. 24) and was annoyed by the repeated question (v. 26). When he started arguing with the Jews (v. 27b), he was reviled (v. 28). It was perhaps a painful experience, thus implying the man's suffering. After he made his logical arguments, he was once again severely insulted and physically cast out (v. 34). If the blind man were meant to undergo suffering in this trial again, his suffering would have a constructive purpose, in that this suffering could strengthen the man's character. In fact, his personality and confidence developed. From the Jews' perspective, because of the parents' reply in the last cluster, the Jews had to interrogate their son again. In the process, they were challenged by the former blind beggar (v. 27b), and had to hear the man preach to them about matters on which they were supposed to be experts (vv. 30-33). This was perhaps a humiliating experience for them. In this sense, they also suffered at the trial. The motif of suffering is not always emphasised, but it silently underlies cluster C'. In cluster B', there seems to be no significant instance of the motif of suffering because this cluster portrays the scene in which Jesus leads the blind man to attain a higher degree of faith. Nevertheless, verse 35 refers to the man's expulsion, thus implying his suffering. Cluster A' compellingly picks up the motif of suffering. The purpose of Jesus' mission to this world is judgment, which separates people. Although the word separation itself implies the motif of suffering, the real suffering referred to in verse 39 is that of those who may become blind because of Jesus' judgment. The utmost suffering is further described in Jesus' verdict in verse 41, in which Jesus, who has the authority to judge, declared the Pharisees to be guilty in sin. Those who cannot see the Light will suffer in the fullest sense of the word. From the above observations, it can be concluded that the motif of suffering indeed underlies the story of John 9. This motif not only helps the reader gain a better understanding of the motifs of revelation and judgment, but also profoundly enriches the story. The hypothesis proposed earlier (section 6 in Chapter 3), that the story will ultimately disclose that not only the blind man but also other characters were suffering to some extent, is verified. This motif of suffering should be recognised as one of the author's important communicative strategies in the story of John 9. By the form and content of this narrative, the author intends to depict how a person can become a true follower of Jesus. In addition, a Christian may deal and argue with his opponents, as is the case with the Jewish authorities in this instance. At the same time, the author intends to demonstrate how unbelief can lead a person to slip into darkness, even without recognising this 'fate'. The points that the author attempts to convey are designed to persuade the reader to develop a more adequate belief in Jesus by writing this brilliant piece of literature. The story of John 9 is indeed an affirmation and illustration of Jesus' self-revelation that he is the light of the world (John 8:12; 9:5). Thus far, and particularly in Chapters 3 and 4 of this study, the focus of attention has been on the story of the blind man. As pointed out earlier (section 3.4 in Chapter 2), my contention is that this speech act analysis, as a literary approach, can suggest or identify similarities or parallels between the world of the story and the original historical world. The story's content and the way in which the story is told can shed light on the nature of the real readers and their historical situations.8 In this section, I shall pay attention to the real readers of John 9.9 In the process of discussion, the reader is taken as an index, even if only in approximation, of the real readers. However, I shall limit the discussion to that which can be suggested only from the text analysis of John 9. Therefore, I shall present the discussion based mainly on the reader's knowledge (or lack thereof) in the following areas: geography and language; Judaism; social setting, and tone of the narrative. The text of John 9 itself is testimony that the real readers only know Greek. This is indicated by the translation of the word Siloam in 9:7, which further suggests that the real readers do not know the significance of the meaning associated with the term. In addition, the term Christ instead of the term Messiah is employed in verse 22 for the real readers (cf. John 1:41). However, the real readers appear to have the ability to appreciate the use of symbolism (e.g., light, darkness, day, night, sight, blindness, water), themes and motifs (e.g., revelation, judgment, suffering), and irony. A Jewish common belief on the relationship between sin and suffering is raised in 9:2. The allusion to the 'I am' sayings in 9:5 presupposes the real readers' extensive knowledge of the Old Testament, if its full significance is to be grasped. The real readers also understand, to some extent, the significance of breaking the Sabbath in 9:14-16. The arguments in the characters' debates in cluster C' reflect Jewish religious understanding. In verse 24, the Jews used an Old Testament oath formula, 'Give glory to God'. In verses 28-29, they proudly presented themselves as Moses' disciples. In verse 31, the expressions used by the blind man, "God does not hear sinners" and "God hears the righteous", are major Jewish beliefs and well attested by the Old Testament. The use of some special phrases, such as prophet in 9:17, Christ in 9:22 and the Son of Man in 9:35, also indicates the real readers' considerable knowledge of Jewish religious terminology. Briefly, the real readers appear to be very familiar with the Old Testament and Jewish thought based on the fact that these ideas are used in the text with hardly any explanation. Furthermore, the real readers understand that the dialogues portrayed in the text (e.g., clusters C, D, C') are conducted in the form of Jewish forensic proceedings. In addition, concerning the blind man's begging in verse 8, the real readers know that giving alms to the poor was a common Jewish practice. The text of John 9 strongly indicates that the social setting of the real readers was one of intense conflicts. This text analysis suggests that the synagogue ban described in 9:22 also refers to the historical situation in which the real readers found themselves in conflict with the Jewish synagogue. Painter (1986:49) also contends: "The evangelist's use of symbols was shaped in the struggle with the synagogue". The place of the real readers was perhaps both within and outside the synagogue. In other words, although some were already separated from the synagogue, others were still connected with it. There is ample evidence to support this. For example, there was a clear distance between Jesus' group and the Jewish authorities. This can be inferred from the fierce debate between the blind man and the Jewish leaders in cluster C' (especially v. 28; Brown 1984:104) as well as from the dialogue between Jesus and the Pharisees in cluster A'. In addition, the text depicts people, like the parents, who could not openly separate themselves from the authorities. On the other hand, the example of the blind man serves to encourage those people to openly believe in Jesus (cf. Brown 1979:72). It appears that all the characters in this Chapter are Jews. The Jews' decision in 9:22 was directed at members of the Jewish synagogue who would confess Jesus as the Christ. There is no reference either to the Gentiles (cf. John 12:20; 18:28ff.) or to the Samaritans (cf. John 4). Jesus was always at the centre of their discussions. In the text, he is progressively described as Jesus as the man, a prophet, the man who came from God, the Son of Man and Lord. In particular, the blind man's confession of believing in Jesus in 9:38 and calling Jesus Lord strongly indicates a Christian character. A seemingly anti-Jewish tone displayed in Jesus' judgment, which he passed on the Pharisees in 9:41, may imply the Gospel's favour for Christians. Based on these observations, the real readers of John 9 would most likely be Jewish Christians who were in conflict with the synagogue. 10A macrospeech act for the entire John 9, which was analysed earlier (section 1.3), is aimed at these Jewish Christians. The perlocution of this macrospeech act is, therefore, to persuade the readers to accept the challenge to continue to believe in Jesus for their own sake. Duke (1982:235) is of the opinion that "the Gospel is written to confirm and strengthen faith, to inspire ongoing fidelity, and - in Vouga's phrase - "to persuade believers to become Christians"'. Brown (1966:lxxv) cites the blind man as the hero in John 9 - "John is inviting the Jewish Christians in the Diaspora synagogues to follow his example" (cf. also Von Wahlde 1995:382). These views correspond to a commonly held conclusion relating to the Gospel that "John was written for a particular community of believers" (Culpepper 1983:225).11 Hence, this study has managed to suggest the life situation of the Johannine Christians who were in conflict with the synagogue, by examining the language used in the story. One qualification is, however, that the result of this study restricts this life situation not only to that of John's own day. As indicated in the text analysis on 9:22 (cf. also section 6.1.2 in Chapter 4), my view is that John 9 is a two-level drama in the sense that it aims to simultaneously describe the life situations of both Jesus (including his immediate followers) and the Johannine community. This study explored The story of Jesus and the blind man: A speech act reading of John 9. Its main purpose was to make a detailed analysis of the text of John 9 from a speech act perspective, emphasising the function of language, and to observe whether or not this analysis also conveys acceptable and valid results as an interpretation of the text. In order to accomplish this purpose, I set up a methodological framework in Chapter 2. The aim of this chapter was to present the major concepts of speech act theory, some important insights from other approaches for complementing this method, some advantages and disadvantages of speech act analysis, my contributions, and my reading scheme (section 3.4 in Chapter 2). Chapters 3 and 4 constitute a practical application of this speech act approach to the text of John 9. In chapter 3, a contextual survey was conducted with regard to key notions such as 'Appropriate Conditions', 'the Cooperative Principle and Interpersonal and Textual Rhetorics', 'Linguistic Assumptions', 'Mutual Contextual Beliefs', 'Johannine Symbolism' and 'the Motif of Suffering'. Chapter 4 examined in great detail the communication that takes place on both the story and the text levels of John 9. Although this analysis does not explain all the aspects of this communication, it has scrutinised at least most of the important aspects in the communication process and represented a speech act reading of the text. It has analysed how the author, by virtue of the narrator and characters, organises language so that the reader may recognise his intention and meaning and his intended result be achieved on the reader. The sections on 'General Analysis', 'Illocutionary Act', 'Perlocutionary Act', 'Communicative Strategy' and 'Macrospeech Acts in the Story of John 9' were used for this particular analysis. As an evaluation of the method, in light of the analysis conducted thus far, a speech act approach could be regarded as a useful exegetical approach for the following reasons. Firstly, this analysis demonstrated the validity of such an approach and developed it further in the reading of a biblical text. In fact, the result of this analysis coincides with a widely accepted view concerning the Gospel's purpose, as pointed out in section 2. Secondly, as postulated earlier in the section on 'Approach of the study' (cf. section 3.4 in Chapter 2), speech act theory is, in my opinion, one of the best ways among modern literary methods in approaching a narrative story such as John 9, where the dynamics of human communication is vividly portrayed in the way in which the interactions between characters often display an intriguing human drama by virtue of their individual utterances with intentions, emotions and subtle nuances. For instance, communicative strategy used in John 9 was elucidated more comprehensively and systematically than previously, as shown in the analysis of the use of Interpersonal and Textual Rhetorics, symbolism, irony, motif, and so on. Thirdly, the concept of macrospeech acts was successfully used in order to identify important meanings of some sequences of microspeech acts, every dialogue scene as well as the entire Chapter. In addition, this speech act approach has shown the possibility of simultaneously using historical and literary approaches in a moderate way. In the process of its text analysis, historical data was integrated as historical contexts to help explore the meanings of given texts. After completing the text analysis, I suggested a possible situation of the original-historical world (section 2). Hence, this study has indicated that a speech act approach can elicit a fresh appreciation of biblical texts such as John 9 and contribute to a better understanding thereof. Although, as evaluated in the last subsection, the method used in this study proves to be a useful exegetical approach, it does have aspects that can be elaborated on and/or improved in the future. The following paragraphs address these aspects. As far as the studies of John 9 are concerned, firstly, historical investigation seems to reach a dead end in identifying the exact historical event described in verse 22. However, this does not necessarily mean that no more evidence can be found. The exploration for more reliable evidence may still be a topic for future studies. The more reliable evidence we have, the better we can determine the illocutionary and perlocutionary acts in the text. Secondly, this study suggested an experimental outline for identifying and describing irony in John 9. This outline is designed to be as practical and as concise as possible, and it appears to work very well when examining ironies used in John 9. However, since irony is a very dynamic and rich literary device, it is impossible to describe every aspect of the nature and function of irony in such a concise outline. It may be expected that a better analytical framework for the scrutiny of irony in literature can be produced in the future. Thirdly, the approach offered in this study is by no means an attempt to nullify or replace all other methods of exegesis. Since speech act theory can generate various ways in approaching biblical texts, this study intended to provide and has offered a useful example of the possibilities. This study attempted to present a satisfactory method. However, there could be room for refinement and improvement in this example. For instance, there may be ways in which to reduce technical terms for an easy adoption of this approach by other exegetes. Fourthly, as mentioned earlier (in the section on 'CS' in 9:16b), a paradoxical relationship between an indirect speech act and a rhetorical question could be investigated further. An indirect speech act normally violates the Manner Maxim, because ambiguity in the sense of deniability is inherent in its nature (for a detailed discussion, cf. the section on 'CS' in 9:8b). However, a rhetorical question, which can be construed as an indirect speech act, is conventionally used as an emphatic declaration; this does not go well with ambiguity. In this sense, should a rhetorical question not be treated as an indirect speech act, or as an exception to the notion of indirect speech acts? Fifthly, as far as indirect speech acts are concerned, scholars suggest that their use is generally motivated by the speaker's politeness (Searle  1981:36; Leech 1983:108; Yule 1996:56; 9:25, 27a). However, my text analysis reveals that this is not always the case. For instance, the indirect speech act performed by the neighbours was motivated by the uncertainty caused by their astonishment (9:8b). Their motivation for its use was an attempt at effectiveness in their language for the sake of persuasion (9:16b). The motivation for the Jews' use thereof was their strategy to exert some pressure on the blind man (9:24). The Pharisees' usage appeared to be triggered by their uncertainty about their own self-image (9:40). In light of these results, possible motivation for the use of indirect speech acts can be elaborated on and explored further (cf. Levinson 1983:356-364; Leech 1983:23-24). Finally, as noted earlier (in sections 1.2 and 3.2 in Chapter 2), it is often difficult to classify speech acts. In fact, there are cases where this study has to be satisfied with the present taxonomy, even if this means that provisional conclusions do not perfectly suit any of the suggested categories (e.g., 9:27b), and where a new category needed to be created (e.g., 9:41). Although it seems to be impossible to present a perfect taxonomy that can describe all kinds of speech acts, there is certainly room for improvement in this area. 1 For a detailed survey of divisions, cf. Menken 1985:227-228. 2 The semi-colons and the double slashes are marked for minor and major breaks, respectively. 3 Verse 4 has an additional speech act of promise, which belongs to a commisive category. 4 For detailed discussions of the Gospel's purpose see, for instance, Brown 1966:lxvii-lxxix; Lindars  1981:56-63; Barrett 1975:8-19; Smalley 1978;122-149; Painter  1993:119-131; Carson 1991:87-95; Du Rand 1994:49-55; Tovey 1997:84-97 and many commentaries on this Gospel. 5 Of course, this does not suggest that the disciples were involved in the healing of the blind man. 6 Concerning 'extended irony', this study follows Duke's (1982:66) definition. 7 The last three objects are Jesus' ministry, Jesus' death, and discipleship. 8 For similar approaches, cf. Culpepper 1983:205-227; Kingsbury 1986:120-133. 9 The inference for the real author cannot be formulated, because John 9 alone does not provide sufficient information (cf. Tovey 1997:269-270). 10 Cf. also Martyn  1979:50-62; Brown 1979:71-73; Karris 1990:104; Stibbe 1993:112-113; Du Rand 1994:59; Koester 1996:9; Kysar 2002:24; Klink 2007:202. 11 Bauckham (1998:147-73) states that the readership of John's Gospel might be "the broad collectively of believers in Christ". Cf. also Bauckham's (2007:113ff.) discussion.